My next suggestion on how to enjoy National Hot Tea Month, is to try a tea you wouldn't normally choose. Step outside of your tea comfort zone! In order to practice what I preach, I decided to do something I never, ever do... drink an herbal tea! I usually shy away from herbals, because I love the flavor of actual tea leaves and don't have much time for purely herbal infusions. I don't really care for floral infusions such as chamomile or lavender, and I cannot stand peppermint. But, I was meeting an old friend at Radiance tea house in the evening, and I didn't want the slightest bit of caffeine at that hour. Besides, I need to keep more of an open mind for herbal teas. So, I looked over their herbal and wellness tea menu and selected Spring in Paris. I don't think I've ever had juniper berries before, so I had no idea what to expect. A few minutes later I was brought a dainty glass teapot with berries and petals floating inside, producing a gorgeous bright, reddish pink brew. The aroma was sweet and tart at the same time. It made my mouth water! The flavor had a strong tart taste (I'm assuming it was the juniper berries), but I didn't really taste the flowers. This is not a bad thing for me. The tea was juicy and bright. A perfect taste of spring on a dreary January night. It would probably taste great iced as well. This tea usually comes sweetened, but I asked for the sugar on the side, which came as a small pitcher of 'rock sugar' which looked like simple syrup. I added a tiny drop to the cup, and it cut the tang and made the tea even more palatable. When I finished the pot, I was offered water for a second infusion. I was surprised that the second steep was just as flavorful as the first. I'm happy to have experienced a tisane that I truly like! 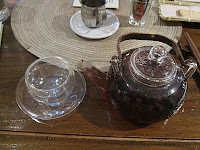 The lesson I learned is to keep an open mind to non-traditional teas, because you never know what you will discover! The tang is the hibiscus. And if you drink gin, that's what juniper berries taste like.